Here's an explanation of how to check whether your Intel's CPU turns on Hyper Threading or not w/ virsh command. plz note that AMD does not support Hyper Threading. ht flags of /proc/cpuinfo means that OS ( not CPU ! ) supports Hyper Threading. How to install dnssec-tools from source code on CentOS 5.6 64bit. source RPM of dnssec-tools is a bit old , so I installed the latest dnssec-tools from source code. configuration file will be stored in /usr/local/etc/dnssec-tools directory. # Settings for DNSSEC-Tools administration. # Paths to needed programs. These may need adjusting for individual hosts. Verifying the zone using the following algorithms: RSASHA256. How to install dnssec-tools from RPM source on CentOS 5.6 64bit ver. Here’s an explanation of how to install dnssec-tools from source RPM on CentOS 5.6 64bit. RPMs you built will be stored under /usr/src/redhat/RPMS/x86_64 directory. This method is configurable on bash 4.
edit ( make ) ~/.bashrc file and add the following line. Tcpreplay replys a pcap file. This tool is useful for testing DUT such as Firewall , IDS etc. You can install tcpreplay through apt-get. let’s send DNS ( DUP ) packets. If the pcap file(s) you are looping are small enough to fit in available RAM, consider using the --enable-file-cache option. This option caches each packet in RAM so that subsequent reads don't have to hit the slower disk. It does have a slight performance hit for the first iteration of the loop since it has to call malloc() for each packet, but after that it seems to improve performance by around 5-10%. Of course if you don't have enough free RAM, then this will cause your system to swap which will dramatically decrease performance. Another useful option is --quiet. This suppresses printing out to the screen each time tcpreplay starts a new iteration. This can have a dramatic performance boost for systems with slower consoles. DNS request is one packet. --pps=50000 means sending 50,000 queries per sec. I decided to cancel my Xbox live account , 'cause my Xbox's 3 years warranty has expired. During the 3 years warranty , my Xbox360 has broken 2 times ( RROD , Red Ring of Death ). Of course I enjoyed xbox 360 , love Halo , Gears of War , Project Gotham Racing etc. I think Xbox 360 is one of the best video game consoles , but that's enough for me. By default , Xbox live Auto renewal is enabled. How can I terminate it? Seen from http://support.xbox.com/en-us/pages/xbox-live/how-to/xbox-live-account-management/cancel-account.aspx , there are two ways to cancel your Xbox live. Which is the easiest way ? Before calling xbox support , plz prepare last four digits of your credit card n' phone number you registered. In my case , it took 5 minutes or so to cancel. Big problem is .... when I go to My xbox -> accounts , I always face an error as below. Why ??? explanation is .. occurs an error in system .. The root cause is what ? Okay , I'm using Google Chromium browser , is this problem ?? 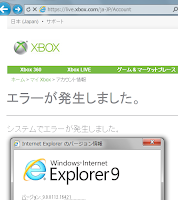 Let's access w/ Windows Internet Explorer 9 on Windows7. The result is ... same error... occurs an error in system. Can't reach My xbox account setting n' can't turn off auto-renewal !!! I tried 'bout 10 times ......result is ... again ! Auto renewal should be off by default !!! Waste of time n' money. From the M$ point of view , this is good system , 'cause M$ can get much $ every month from auto-renewal subscription fee. Ubuntu 11.04 : chromium browser hangs..